Michurinist biology was a state enforced doctrine in the former Soviet Union and its satellites during the Cold War. It was not a coherent system but consisted of four separate parts: agrobiolOgJJ of Lysenko and dialectical cell biology of Lepeshinskaya, which will be discussed in my talk, soil science of Wiljams, and neurobiology of Pavlov. Lysenko rejected the existence of genes and their role in heredity, Lepeshinskaya rejected Virchow’s thesis that cells arise only form other cells (omnis cellulae cellula) and that new cells can arise de novo from non-cellular living matter. These restrictive and experimentally unsupported versions of important aspects of biology led to significant damage to Soviet biology, and also to practical agriculture and clinical medicine. They developed essentially independently and were linked to each other only in the mid-1940s. Agrobiology had the greatest impact outside of the USSR, including China and Japan. Dialectical cell biology also became an important reference point in various nonorthodox biological and medical schools, especially in the Orient: Bei Shizhang’s theory of cell reformation in China, Chishima’s and Morishita’s neo-haematology in Japan and Kim-Bonghan’s primo-vascular system in Korea. Major criticism started in the former Soviet Union already in the 1950s. Agrobiology essentially disappeared by the mid-1960s. In recent years, however, significant attempts are being made to revive Lysenko’ s fame in Russia. A number of monographs and articles claim that Lysenko’s theories were right and presaged modern developments of molecular biology. There is a violent debate ongoing in Russia on this point. There are also claims that Lepeshinskaya’s dialectical cell biology was a pioneer of the study of stem cells. I will discuss the scientific and political motivations for this resurgence. Michurinist biology was a state enforced doctrine in the former Soviet Union and its satellites during the Cold War. 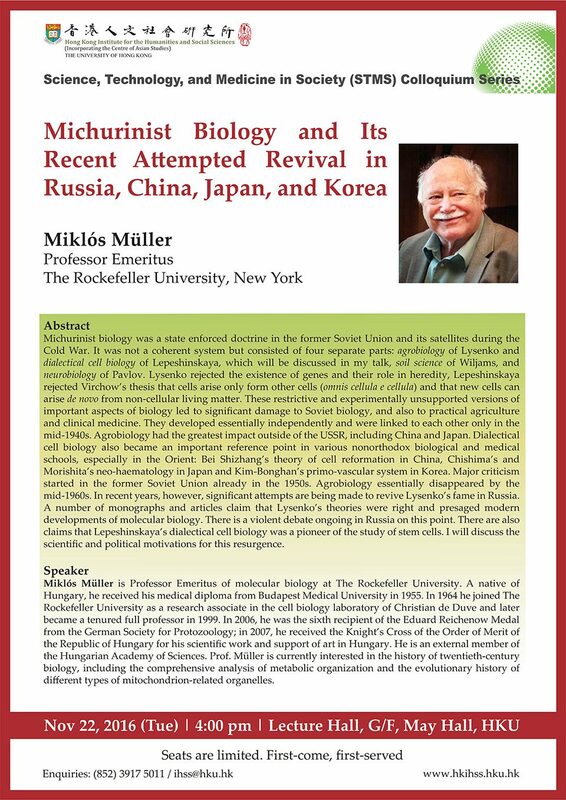 It was not a coherent system but consisted of four separate parts: agrobiology of Lysenko and dialectical cell biology of Lepeshinskaya, which will be discussed in my talk, soil science of Wiljams, and neurobiology of Pavlov. Lysenko rejected the existence of genes and their role in heredity, Lepeshinskaya rejected Virchow’s thesis that cells arise only form other cells (omnis cellulae cellula) and that new cells can arise de novo from non-cellular living matter. These restrictive and experimentally unsupported versions of important aspects of biology led to significant damage to Soviet biology, and also to practical agriculture and clinical medicine. They developed essentially independently and were linked to each other only in the mid-1940s. Agrobiology had the greatest impact outside of the USSR, including China and Japan. Dialectical cell biology also became an important reference point in various nonorthodox biological and medical schools, especially in the Orient: Bei Shizhang’s theory of cell reformation in China, Chishima’s and Morishita’s neo-haematology in Japan and Kim-Bonghan’s primo-vascular system in Korea. Major criticism started in the former Soviet Union already in the 1950s. Agrobiology essentially disappeared by the mid-1960s. In recent years, however, significant attempts are being made to revive Lysenko’s fame in Russia. A number of monographs and articles claim that Lysenko’s theories were right and presaged modern developments of molecular biology. There is a violent debate ongoing in Russia on this point. 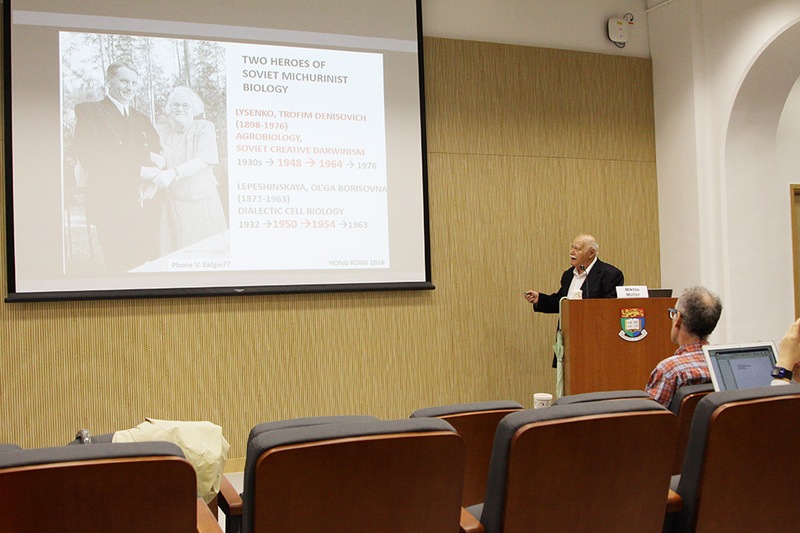 There are also claims that Lepeshinskaya’s dialectical cell biology was a pioneer of the study of stem cells. I will discuss the scientific and political motivations for this resurgence. 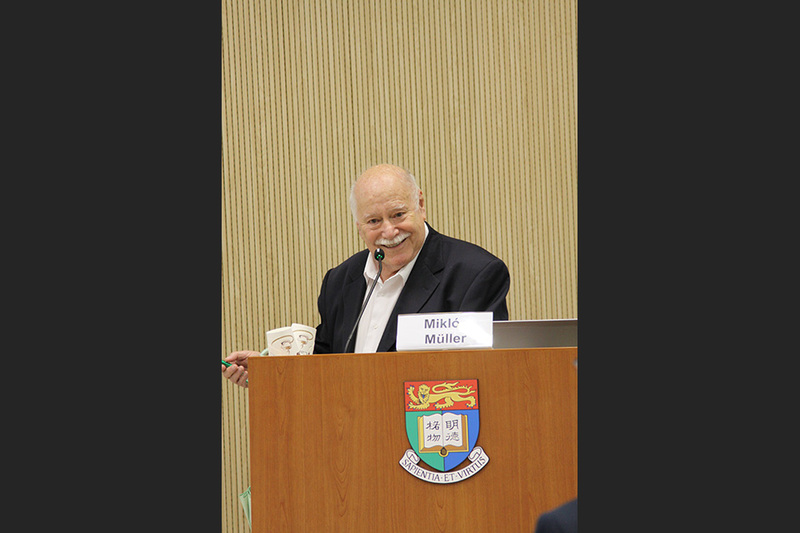 Miklós Müller is Professor Emeritus of molecular biology at The Rockefeller University. A native of Hungary, he received his medical diploma from Budapest Medical University in 1955. In 1964 he joined The Rockefeller University as a research associate in the cell biology laboratory of Christian de Duve and later became a tenured full professor in 1999. In 2006, he was the sixth recipient of the Eduard Reichenow Medal from the German Society for Protozoology; in 2007, he received the Knight’s Cross of the Order of Merit of the Republic of Hungary for his scientific work and support of art in Hungary. He is an external member of the Hungarian Academy of Sciences. 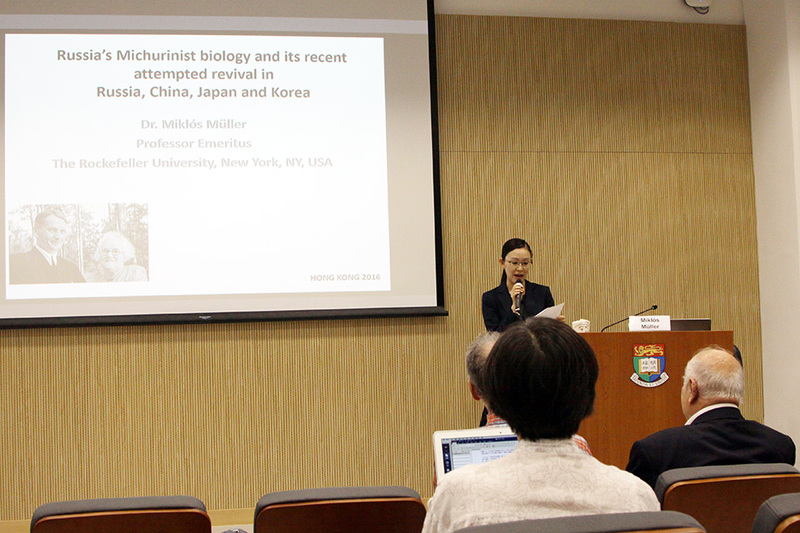 Professor Muller is currently interested in the history of twentieth-century biology, including the comprehensive analysis of metabolic organization and the evolutionary history of different types of mitochondrion-related organelles. This is an event organized by the “Science, Technology, and Medicine in Asian Societies” Cluster.